It's Memorial Day weekend. I am so thankful to all the men and women who serve our country and especially my hubby who served in the Navy for quite a few years and seen a few wars. It's fitting then to make a red, white and blue card today. I kept it really simple. 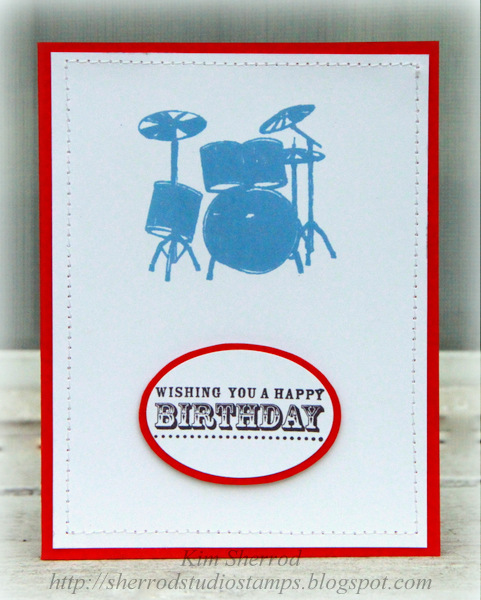 Stamped the drums onto white cardstock, popped the sentiment using 3-d foam and added some stitching. Like the simplicity of your card. Thanks for joining us at FOSTV. Great card. Love the drum set you used. Thanks for playing along with Friends of SpeedyTV. We hope to see you again next week. This is fun and funky in cool patriotic colors! Awesome card for our Memorial Day challenge. Thanks for joining us this week at FOSTV. This is lovely, thank you for joining us at One Stop Craft Challenge..And good luck. Wonderful card for Memorial Day. Huge thanks to your husband for his service to this country. So glad you joined us this week at FOSTV. 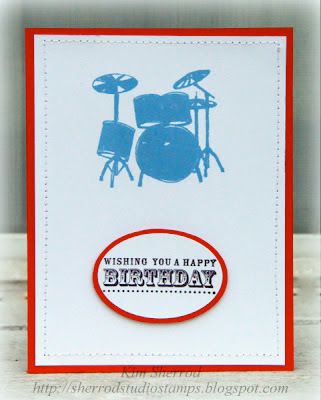 Awesome CAS card for a guy! Thanks so much for playing along at DRS Designs! Thanks for joining us this week at FOSTV. Great CAS card. And thanks to your husband for his service to our country! First, thanks to your husband. This is a wonderful, clean creation. Thanks for playing with us at DRS Designs. Beautiful CAS Card!! Your stitching is perfect! Thanks for joining the challenge at DRS Designs. And special thanks to your hubby for his service! yes, the colours are perfect for today and I love how you were inspired by Aga's layout :) Thanks for playing with us over on CASE Study!